1 Pack Kyushu Pancake Flour mix (200gram). 1. Mix the pancake mix, egg, fresh milk and cocoa powder together to a smooth batter. 2. Cook the batter on a flat pan with diameter of about 10-12 cm. Each pack of flour mix would give you 7-9 pieces). 3. 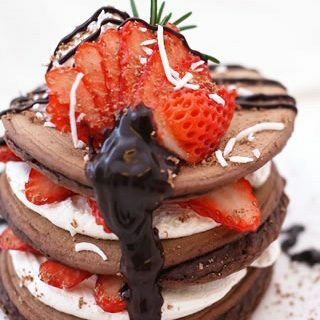 Spread fresh cream and fresh strwberries in between the layers of pancakes. You can decide how many stack sof pancaje you desired. 4. Decorate the top of the pancake with assorted fresh berries and fruits and add on fresh cream to complete the dish.